When my friend Jessica and I were planning our last food photoshoot, she suggested we make some kind of summer salad. I thought about that idea for awhile. What is a summer salad? What makes it different from a normal salad? Now that we are getting more and more cloudy days showing up in Seattle, what can I eat that makes it feel like summertime? This was an extra challenging assignment for me, in that I don’t ever make fancy salads. And by fancy, I kind of mean anything other than lettuce, tomato, croutons, and some kind of dressing. Sure, sometimes I add carrots, or whatever leftover herbs I find in my fridge, if I’m feeling frisky. I’ve even been known to throw on some pumpkin seeds from a bag in my cabinet. But whenever I see recipes for salads online, I tend to skim over them, feeling like, “Its a salad. It doesn’t have to be so complicated”. However, I’m very pleased that I had to spend some time thinking about summer salads. All a summer salad should be is something light, fresh, and filled with the bounty of summer. I thought back on all the lovely vegetables I’ve enjoyed the last few months. 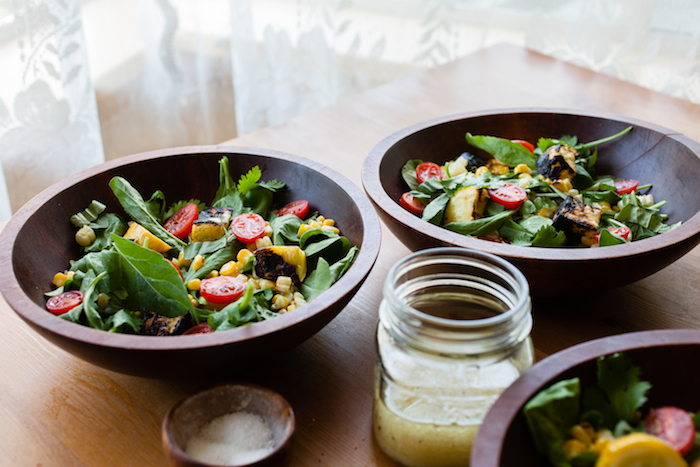 One of my favorite things this summer was when I made a charred corn and black bean salad for the 4th of July. Basically, I roasted a few ears of corn on the grill, cut them off the cob and mixed the corn with some black beans. I tossed in a bunch of lime juice and cilantro and called it a day. And you know what? It was killer. I love corn in the summertime! And, cooking corn on the cob on the grill is a fun and quick trick. You don’t have to think too much about it. Just oil it up, toss it on, and cook it until it gets browned in spots all over. If it starts popping, you are certainly done. And even if it gets a little burnt, it is still going to taste great. Just call it charred! So, next time you have your grill fired up, (Or if you have a gas grill, just do it. It takes 5 minutes to warm up so you don’t have any excuse not to be using it. 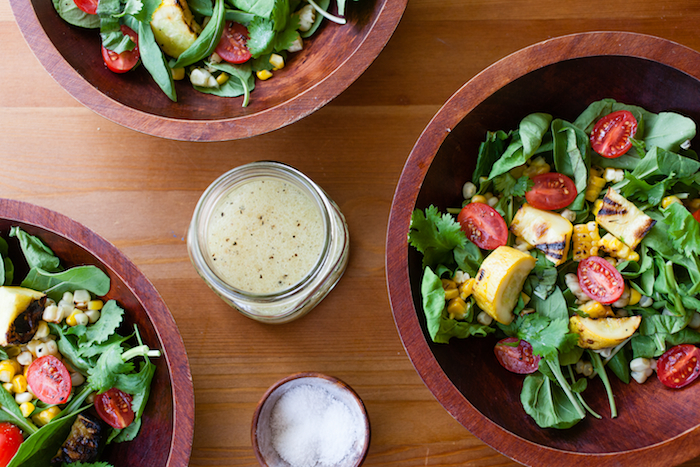 ), make this bright and delicious salad to go alongside whatever else you are grilling. Or, just make this baby up for a light meal for yourself. It is pure summertime in every bite. Heat an outdoor grill to medium. Drizzle corn and squash with olive oil and season with salt. Grill corn until it has singe marks on all sides. Grill squash until it has grill marks and is easily pierced with a fork. Take vegetables off of the grill and let cool. When cool, cut the corn off of the cob. Slice the squash into 3/4 inch chunks. In a large bowl, mix arugula, cilantro, and basil. Top with tomatoes, corn, and squash. Crack fresh black pepper over the top. To make dressing, mix the lime, sugar, and salt. Pour in vegetable oil in a slow, steady stream while stirring the mixture. Dress the salad, serve, and enjoy! I must get across my appreciation for your generosity for persons who absolutely need guidance on this particular area of interest. Your real dedication to passing the solution all-around appears to be extremely significant and has in every case empowered employees like me to attain their goals. This invaluable guideline indicates much to me and far more to my fellow workers. Thanks a lot; from each one of us.